A bundle of club and fixture updates to keep you all posted. 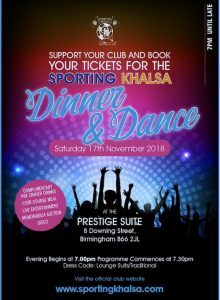 First, and most importantly, the now legendary Sporting Khalsa dinner and dance returns on the evening of Saturday November 17. It is, once again, taking place in the luxurious surrounds of the Prestige Club in Downing Street, Birmingham. Those who have been before will vouch for the spectacular amount of fun this night is. Tickets and tables are available from behind the bar at the 442 Bar and Lounge. Importantly: Tuesday’s away game against Paget Rangers in the Walsall Senior Cup has been postponed to enable us to play a home fixture in the Staffordshire Senior Cup against Eccleshall (kick off 7.45pm). The powers that be decree it takes priority. We just play football. We’ll update as soon as we know. In the league cup, having beaten Walsall Wood 5-2 in the first round, we will travel to face Brocton in the second round on Tuesday November 6 and the winners have this week been drawn to face Ilkeston Town away in the third round. Clearly, the date has yet to be fixed. You keeping up with all this? Finally: Khalsa or Wrens Nest have been drawn at home against Midland Football League Division One leaders Lichfield City in the second round of the J W Hunt Cup on a date to be determined. The first round clash with the Wrenna takes place at the Aspray Arena on Tuesday October 23 (ko 7.45pm). It helps make life easier as we are very often subject to the vagaries of rescheduled games due to cup fixtures, replays and the weather. Also well worth keeping an eye on @sportingkhalsa.